Well, the local news is filled with information on Cold, Snow and Wind Chill Factors in regards to this storm. We have not had this cold of a snow storm recorded in a 100 years. I am not going to brush this to the side.. Ottawa was the coldest capital in the world, Friend of ours in the arctic teased that they were warmer then we were, the snow, o the snow.. so much snow..
Little Wee Paris was in an out in her Jacket as fast as possible.. and even in that time, she would start doing the cold foot dance. While the farm dogs hated it, they were not allowed to follow us around doing farm chores and where kept in the house. 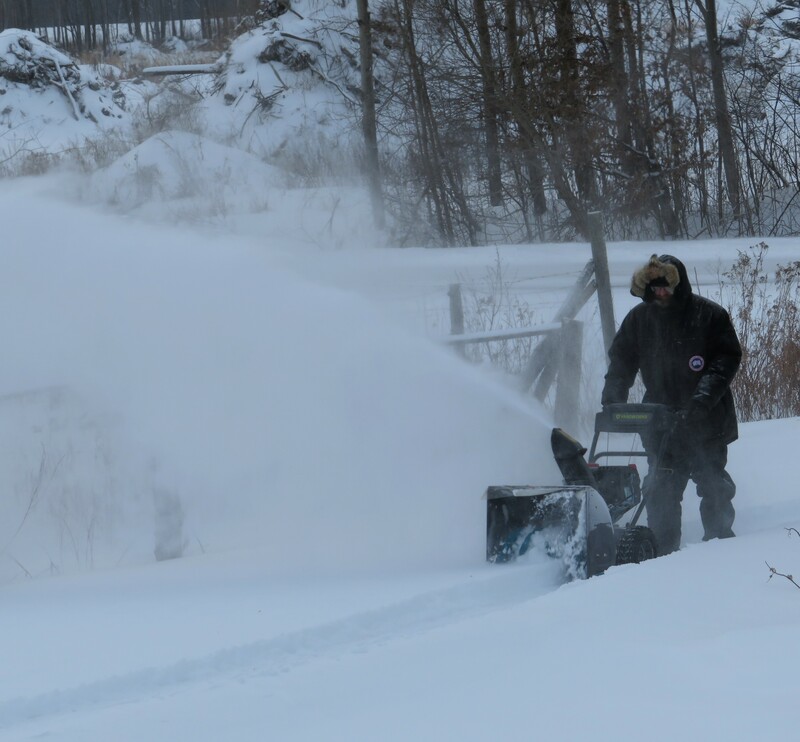 While they are used to going out for a couple hours a day and so they do have a reasonable amount of “built in cold weather toughness” this was beyond that..
this was bare skin freezes in mear minutes..
Last year we wondered if we would like that snow blower.. the answer is yes!! While there is still shoveling to do and I am waiting for the cold to break before I do the extra’s..
Let me tell you in this deep bitter cold, you do what must be done and you wait for the rest, we are to have a break in the cold tomorrow on weds. That means we have been in the Deep Freeze now for four days. The cats are in the house (other then two that will not come in, who are in the croft with lots of warm bedding to snuggle in) and they are going stir crazy.. thank goodness for catnip to keep everyone calm.. They are not used to being “cooped” up for this long but they also do not want to go out in this cold and I don’t blame them. The horse’s hear us and meet us at the gate and follow us around no matter how cold and bitter it is.. but thankfully the poo piles in the big barn lets me know that they are using it most of the time to be out of the weather for eating and resting. Its very important to keep everyone drinking but really important for the horse’s.. so while they have access to their regular water, we are also hauling room temp water out twice a day to encourage them and the sheep to drink extra. I will need to start worrying about ice balls forming in hoofs during the warm up and then cool down, but that I think will be its own post because snow balls can effect different critters and its worth talking about in a bit more detail on ways to deal with it depending on the critter. Yesterday everyone was good in their checks.. so it looks like one cold duck was the worst of what we got and she made a full recovery. The house has held up well, the repair work has held and we have had no frozen pipes this year and I expect that this will be the coldest we get so that is outstanding news indeed. The sun came out today and its pouring in the living room, only those curtains are open to allow the solar heat in while all the other curtain closed to keep out the cold. Its that blue sky, sunny bitter cold day today.. its different then the snow storm/wind/cold.. One more day, one more day they say! I hope everyone stayed safe if they have been hit by this storm. This entry was posted in Life moves on daily and tagged Cold Snow Storm, Coldest Snow Storm in a hundred years otttawa valley, Dealing with days of bitter cold, Deep Winter Cold. Bookmark the permalink. I remember temperatures like that when I lived on the Prairies and in Northern BC. I don’t envy you at all. 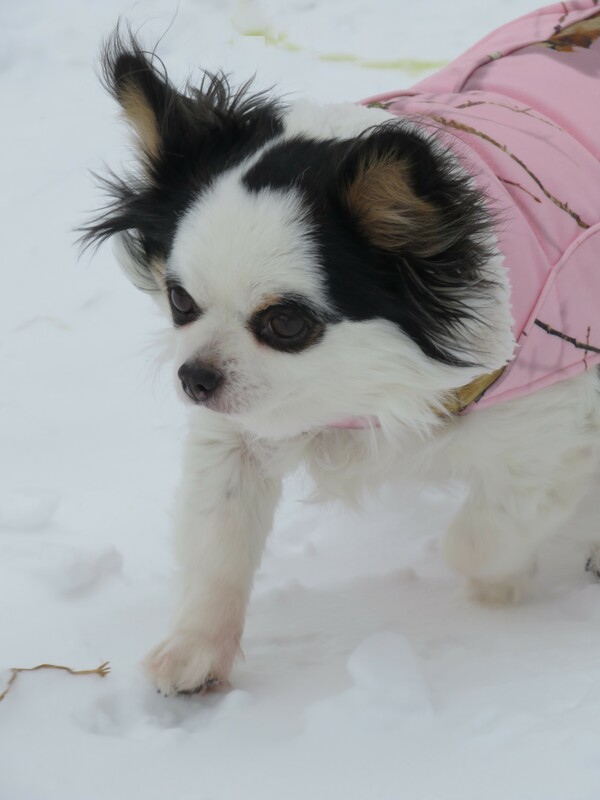 Stay warm and stay safe. Me too.. Its been nasty of this area for sure but I remember one storm at “pete’s” a farm my folks were renting and it stormed for five days, we had ran a line to follow from the house to the barn and back. It was -40 for days.. It was so cold in that old farm house, we ran everything and we all kinda lived in the main area that was the warmest. All the critters were moved into the main part of the barn and locked down. Its the closest to this one that I can remember in my own memory and that would have been early 80’s. Now I have had worse in Iqaluit but its the artic, you expect worse.. the first big one was why I learned we had to have entry and exits on both sides of the house when I watch the snow come down and be blown in those high winds to the point that they could solidly cover vehicles and 3 level high houses.. they just disappeared under those drifts..
We used to extra hay the horses in those temps, because yes digestion creates heat. We also dropped a water heater in a fifty gallon barrel of water to make sure they drank enough. Also, dehydrated horses tend not to realize they are thirsty….we always provided loose salt – salt triggers the thirst which helps them get enough water. 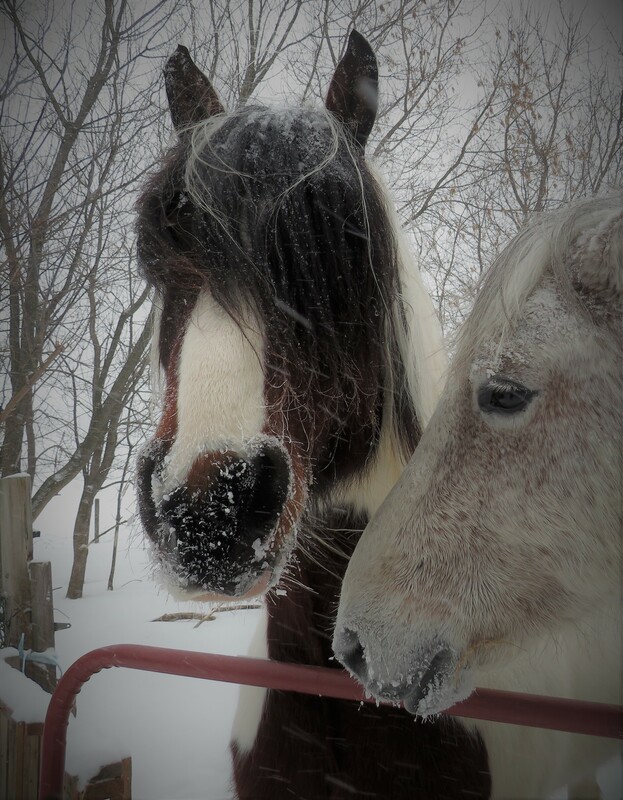 For years I made do with salt blocks – but at a horse conference it was pointed out to me that horses have such soft tongues they have difficulty dealing with blocks, especially in the winter. Made sense to me anyway – and I went with loose equine salt after that. Our drafts used to whack the blocks with their hooves in the winter and bust them into chunks and try and deal with the pieces. It didn’t occur to me they were having trouble accessing enough salt. Stay safe and critters alive. We had the opposite. A month of cold broke and raised the temp by 26degrees in 24 hours. All the snow melted. Then it came back. Bam. Flooding, then ice sheets. Roads blocked by flowing ice. I was driving when it changed. Ice built on the windsheild that couldnt be wipered off. Luckily I got home. I cleaned stove pipes while we could survive without stove heat. It was nice to be able to get back up the driveway though.